Eastman EBB431S BBb 4/4 4 valve Silver Plate Tuba. 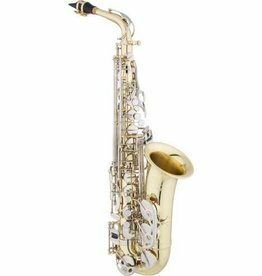 Eastman’s entry model student alto saxophone. A traditional-style professional saxophone. The EAS640 is a free blowing horn with a focused, big sound and precise intonation. Solid construction with ergonomic hand position and extras such as adjustable palm key heights. This is a great quality Medium bore (.454") student trumpet. Eastman's student trumpets feature a handspun and hand-graduated yellow brass bell with wire-reinforced rim, torch-annealed bell tail, Nickel-silver outer slide and a Clear lacquer finish.